I bought this after seeing on a few different blogs and have to say, it was a very wise (and cheap) investment. The facial buffer works with pretty much any cleanser, although not so much with thicker cream cleansers and just adds a bit of extra exfoliating ‘oomph’ to a cleaning routine. When cleansing I need something that I really ‘feel’ like it’s working – this definitely delivers on that. I actually picked up a second one of these that I use to exfoliate the dodgy bits (elbows, knees, ankles) before fake tanning as I find it works really well at this – preventing horrid orange patches and very simple. Just be careful not to get carried away and scrub too hard. One of the best £3 I have spent. The accessories at Body Shop are amazing! Is this any good for removing makeup?! i agree, i am in love with this buffer! my skin feels so smooth every time i use it. I think you would have to be careful with sensitive skin as the texture is quite rough. 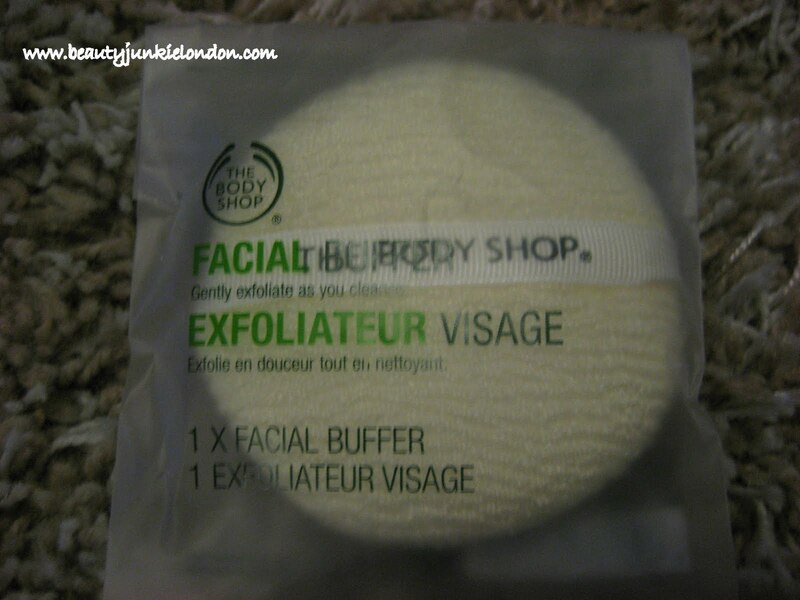 The Body Shop also do a softer facial sponge that might be better – or try muslin cloths with your normal cleanser. You can get these pretty cheap at Mothercare/baby stores.